As everybody frets over a soft patch in the US economy and the backward looking Q2 GDP report today, the Chicago PMI for July came in at a very robust 62.3. A full 6 points above the 56 consensus and even 4 points above the most optimistic economist at 58.4. The markets initially sold off based on the GDP report, but some sanity has returned after the Chicago PMI. Actually the market is still somewhat acting like a lunatic considering the GDP report should be meaningless and the Chicago PMI + earnings reports are so bullish that the market should be soaring today. Why does the market even care about the GDP report? Do we now go back and adjust the terrific earnings reports of Intel (INTC), Caterpillar (CAT), or FedEx (FDX) because GDP was weak? Does it in any way impact guidance? The answer is a resounding NO! Besides, most of the SP500 doesn't even rely on the US for growth anymore. 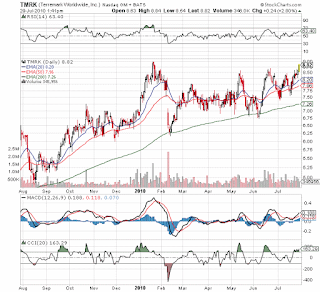 After consolidation in the $7 - $8.5 range since the beginning of the year, TerreMark Worldwide (TMRK) has finally broken above $8.8 a level they've struggle at a few times this year. Its now testing the 52 week high of $8.98 seen in late January. TMRK is a core holding of our Growth and Opportunistic Growth portfolios. TMRK is our prime cloud computing investments and the move of the government to the internet. They provide managed information technology (IT) solutions with data centers in the United States, Europe, and Latin America. It delivers a suite of managed solutions, including colocation, managed hosting, managed network, disaster recovery, security, and cloud computing services. As we've been writing for the last month, the China economy and hence the local markets continue to rule the world. See China Market Rules the World on June 30th. 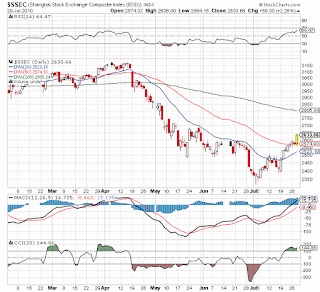 Last night, the Shanghai market surged over 2% and made a very impressive jump off the 50EMA showing signs of more gains coming in August. Copper has also been surging and met coal prices remain steady so the commodity stocks such as Massey Energy (MEE), Alpha Natural Resources (ANR) and Freeport-McMoran (FCX) continue to be our favorite domestic stocks to play this theme. 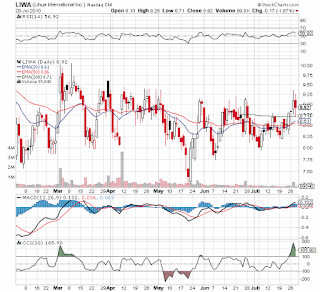 Bought Lihua International (LIWA) at $8.76 for the Opportunistic Growth Portfolio. LIWA is a producer of refined copper products in China. Yesterday they announced the opening of a new copper smelter that will double capacity. Today the stock fell to below the opening price prior to the announcement so we used the weakness to buy right at the moving averages. As I'm about to report on, the China markets have made a dramatic move off the bottom this month yet China stocks that trade in the US continue to lag. LIWA is a primary laggard and trades at roughly 4.5x the estimated 2011 earnings of $2. Considering LIWA makes around $1.2 on existing capacity I'd expect earnings for 2011 to double with capacity. Doesn't really matter with the stock price stuck below $9 whether they earn $2 or $2.5. Over the last 2 years, the Growth Portfolio has beaten 95.7% of the portfolios tracked on Marketocracy.com. Still leaves some room for improvement but still a very solid performance. The last 3 months through June were very disappointing, but its still encouraging that the portfolio beat all but 4% of the portfolios over that time period. Q3 is starting off very solid with a 12.5% gain with 3 days left in July. Counting normalized fees, the portfolio is beating the SP500 by roughly 12% per year. Today, Sears Holdings (SHLD) announced a deal to lease 43,000 sq/ft in their store at the South Coast Plaza in Costa Mesa, Calif to Forever 21. No terms were released on the deal, but anybody following SHLD knows that their biggest underutilized asset is their real estate. In so many cases, they'd be better off by leasing stores instead of operating them as a Sears or KMart. Having a difficult time finding any solid details on the volume of leasing deals they've done. This appears significant in terms of finally moving forward on redeploying the valuable real estate in a more profitable manner though I haven't been able to locate any concrete data. "This agreement is a great example of Sears Holdings selectively redeploying its asset base to improve the retail experience for consumers while working to create long-term shareholder value," said Jeff Stollenwerck, president, Real Estate for Sears Holdings. Ok, maybe the Q2 earnings report and movement was surprising to others, but it was clear from the F5 Networks (FFIV) report and 13% surge on Thursday plus other reports from the likes of VMWare (VMW) that Riverbed Tech (RVBD) would likely report a blowout quarter. Whats really surprising is the lackluster jump on Thursday and the monster 14% move on Friday. After today, Riverbed Tech has become the largest position in both the Growth and Opportunistic Portfolios. *Q2 adj. EPS $0.25 vs est. $0.22 * Q2 rev $126.2 mln vs est. $119.4 mln * Sees Q3 EPS $0.27 vs est. $0.24Product sales rose more than 40 percent, marking its fourth consecutive quarter of product revenue increase, the company said in a statement. It appears that the downtrend started on April 26th has finally been broken. Our at least for the moment because lately the market could just as easily whipsaw back down this afternoon. Bullish earnings reports from CAT, T, UPS, and others helped pushed the focus back to earnings and away from the rehashed story that Bernanke told yesterday. The key that most people seem to be missing is that corporate profits are based on what's going on in China, Southeast Asia, and South America as much as the US. So the economy can remain weak, but that doesn't mean that profits will follow the US. Stocks remain extremely undervalued because of the focus on valuing the market based on US weakness. As of 12:20cst, the market has actually broken above the 200ema which would be extremely bullish. Lately though it hasn't been able to hold these bullish levels so we'll need a good close and a positive follow through. Prior to the opening Cephalon (CEPH) dramatically and surprisingly upped guidance by some 30%. CEPH didn't provide any details for the smashing results or provide full year guidance. The lack of details regarding the durability of these results is likely holding the stock down to minimal gains today. Regardless of the details, CEPH already traded at a forward PE of just over 8 so any news on beating estimates should send this stock soaring. The market continues to discredit positive news. Great opportunity to buy on the cheap. The Net Payout Yield Portfolio added Texas Instruments (TXN) and WellPoint (WLP) Both stocks have had huge buybacks in recent quarters providing a big boost to earnings going forward. The annualized yields would be easily over 10% so we used the weakness at the opening to add to positions in both stocks. WLP was added a round $52.00. Position size now 3.7%. Texas Instruments (TXN) ups the midpoint of guidance for Q3 to .69 from .64 but the stock sells off 6% after hours based on a basically in line Q2 number. Our expectations would be for the stock to rebound by market opening tomorrow as the Conference Call likely calms the market concerned that revenues were a touch light in Q2. What blows our mind is that TXN reported the highest quarterly operating profit on record, guided up for the next quarter and its not good enough for a market trading at low end valuations. The market appears to expect doom right around every corner yet its not happening. Q3 is going to be very strong for TXN even in the face of a dismal Q2 for the markets. Yesterday the market got most of the negatives holding it back solved.... Goldman Sachs, BP, and FinReg. Heck, even Apple resolved the issue with the iPhone4 today. So what happened other then a 200 point jump in the Dow? Oh wait, the market didn't even jump at all and had a nearly 3% drop. Huh? 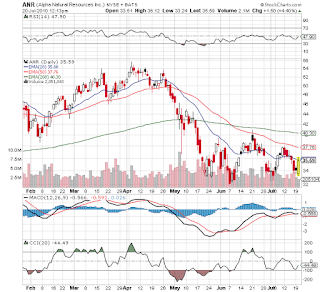 Were the earnings of Bank of America (BAC) and General Electric (GE) that horrible? Oh wait, they actually beat earnings and the news about the FinReg costs to BAC shouldn't have been that shocking. Consumer Confidence had a huge drop, but who was shocked by that? The markets saw a huge drop over the May/June peirod. What consumer could be confident? Maybe today's huge drop was just a headfake from an overbought position. The news going forward will be bullish for a market run. Nothing to hold us back now and a lot of possible bullish moves by Obama and the Dems could be coming down the pipeline. Today's trading was all about clarity. 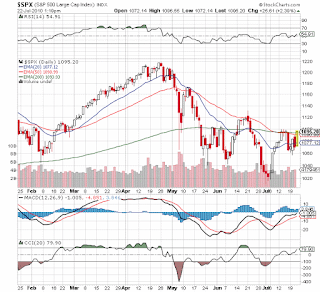 Though the market started weak and it appeared that the 200EMA was going to become major resistance, all of the troubles in this market seemed to clear up within hours. First, BP caps the well and stops the oil from gushing into the gulf. This will improve confidence assuming of course it continues to work and passes numerous pressure tests. Second, Congress passed a Financial Regulation bill that lacks true to punishing power to the industry. While not a bullish bill by any means, its at least done and alot less harmful then feared. Third, Goldman Sachs (GS) settled with the SEC on fraud charges. The fine was only $550M which was considerably less then feared. With GS being such a market leader, this settlement will unleash the stock and one of the leaders that has held the market down since mid April. With all the focus on BP, everybody has forgotten the damage done to the stock of Massey Energy (MEE) after the explosion at the Upper Big Branch Mine (UBB) in early April. MEE might be thankful for the attention focused on BP, but the stock price hasn't come close to recovering. All mining stocks are down over the last couple months so its not as though MEE has been harshly punished just for the explosion but it is down significantly more then industry leader Peabody Energy (BTU). The difference between MEE and BP and what interests us in the stock is that they've made several brilliant moves even in the face of the tragedy. MEE is working to enhance shareholder value while BP hopes to keep shareholder value from completely collapsing. AerCap (AER) continues to develiver planes, sign leases, and buy new planes. The market continues to ignore the continous progress in growing operations. AER released its Q2 transactions report today showing 18 new deliveries and the purchase of 19 planes plus contracts to buy 9 more. AER trades at 5.5x earnings and regularly trades in whipsaw fashion though the company continues to plod along with limited risk. The market percieves a much bigger risk then the reality. AER and Genesis Lease (GLS) survived the financial crisis with limited impact. They've had only slightly material impacts from the Great Recession and yet they can't get traction in the market. Not that its all that surprising considering the general market and Stone Fox Capital owns several other stocks with similar valuations. Something I'll be doing monthly going forward and posted on my profile on the Covestor.com site. Any trading detail is specific for the Opportunistic portfolio. Amazingly a country roughly 1/10th the size of the US created slightly more jobs in June then the US. Canada added 93K jobs versus the 83K in the US. Its not a surprise to anybody that Canada would have a stronger economy due to its high dependence on resources needed by China and other emerging economies. But for Canada to create more jobs then the US is a direct indication of the policy issues in the US. The US should be creating 300K private jobs a month coming out of this recession, but various reforms in healthcare and finance have led to stop hiring. Not to mention that attack on offshore drilling will only help move jobs inland to places like Canada. Doug Kass is one of our favorite bottom pickers. Though he claims to not be a permabear he is typically paid to short stocks. Whenever he calls a bottom its typically of more meaning then a bull. After all he called the Generational Low back in March of 2009 and now hes placed a bet that the lows have been hit for 2010. Not a big fan of Yahoo! Tech Ticker but today they had OptionMonster's Jon Najarian as the guest host so it was worth checking out. The ISM Services Index is set to be reported on Tuesday and will be very crucial to the market direction. According to Bloomberg economists expect a whopping bullish reading of 55. Are they serious? The markets are down some 17% and the ISM Services will only fall slightly from the 55.4 in May. Sure July could easily fall off a cliff, but if June is still as strong as a 55 then I don't understand the fears in the market. What gets me is if the number comes in at 54 and the market acts all surprised. To us, even a 54 would be bullish and indicative that the selloff was unwarranted. The consensus range is from 53.5 to 56. Take the low end of the range and don't act surprised. After all the only way to a double dip is for this index to fall consistently below 50. If June doesn't even drop below 54, this economy will need another shock beyond Europe or BP or the China slowdown. Since China plays such a big position in the global trade, we've begun watching their markets alot closer. It also gives us something to watch with the US markets closed and China having 2 trading sessions since the US closed last Friday. Especially since Japan has for a long time lagged any US moves. 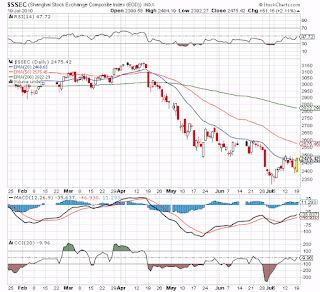 China is the one market that seems to move prior to the US. Unfortunately its been all down for a long time now. On Monday, Shanghai closed down .8% after another early plunge followed by an afternoon rally. This made a 2nd attempt to break down towards the 2300 level. As of today, the market is up some 1.7% at least signaling a short term bottom. It'll be worth watching to see whether a bottom was put into place. Expect the US markets to at least follow tomorrow. Any selloff in the AM should be bought. 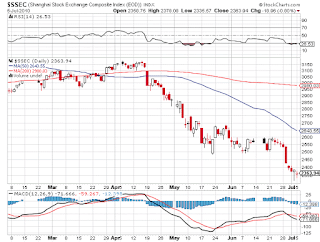 The US markets are very oversold so they are at least due for a bounce. Most think it should be sold but we'll see how it plays out first. Very odd to the Junk Bond Funds doing so well in the face of a recession. 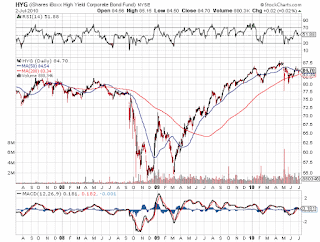 The iShares High Yield Corporate Bond Fund (HYG) has in fact held near recent highs. Much higher then even back in 2007 prior to the collapse of the economy. What do junk bond investors know that equity guys don't? Surely these bonds would plunge if a double dip was imminent. Why is it holding up better then in mid 2007? Sure corporate profits are strong and the general balance sheet is strong, but these companies wouldn't have junk bonds if they feel into that category. A double dip should be disastrous to such a company. Stocks of such companies like a Terex (TEX) or Liz Claiborne (LIZ) have just about been annihilated in this selloff but not the bonds of other high yielders? Thought bond traders always knew best. Non confirmation of the Junk Bond Funds. First, the HYG has hardly budged from recently highs and has easily rebounded from the flash crash lows. Cheap, cheap, cheap. Amazing how truly bearish this market has become. All earnings expectations are scrutinized to the nth degree. Even a strong company like Coventry Health (CVH) can up guidance for 2010 by nearly 10% and see the stock barely react with the PE at only 6.7. The stock has been down 35% over the last couple of months. How did we get to a point where investors are so bearish that they completely ignore fundamentals? 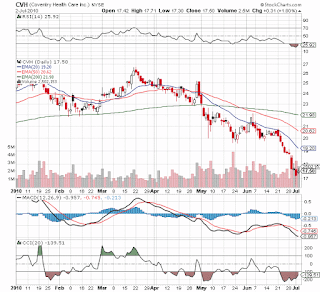 Sure CVH is in the healthcare sector and Obama's new healthecare bill raises alot of concerns in the industry, but CVH has had a couple of months to study the impacts and they are comfortable enough to up guidance. Instead of rehashing the same data that Mark Perry reported on the Monster Employment Index I thought I'd just re-post it. Regardless of what the government data shows and is typically adjusted, the MEI is showing strong growth throughout this year. Do you trust a report that is very manipulated and often adjusted later or one that shows the facts? Online recruitment is soaring. 1. 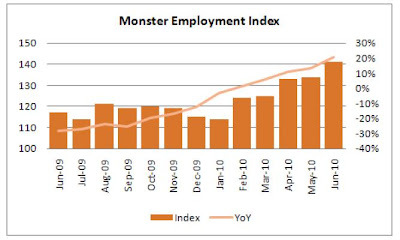 The Monster Employment Index climbed 7 points in June and the annual growth rate, now at 21 percent (24-point increase), is at its highest since September 2006. 2. Online demand for workers rose in 17 and remained flat in 5 of the 23 occupational categories in June with healthcare support registering the largest gain on a month-over-month basis. The 2nd largest economy finally turned bullish after 2 years. What Japan does hasn't been much of a factor in the markets for years. In the early 2000s, Japan was important to tech stocks but that market has been so stagnant for a long time that they've become irrelevant for nearly a decade. Whether or not this is a signal that the sleeping giant is about to awake is yet to be seen, but the growth in Asia ex-Japan could finally have a very positive impact on Japan. Capital spending was also forecast up 4.4% which was significantly higher then the negative 0.4% forecast after March. Japan might return to a growth mode as the region around them soars. It might just be time to begin focusing on this lumbering giant again.